Malaysia and Singapore are like twins, Tun Dr Mahathir Mohamad said yesterday, on his first official visit here since becoming his country's prime minister again. "Except perhaps the elder twin is a little bit bigger than the younger twin, and a bit older," he said at an official lunch hosted by Prime Minister Lee Hsien Loong at the Istana. "It is not often that we see countries which come together and are separated, and still work together and help each other," he added. Both also have a role to play in the region and, together, can be effective in helping it grow, he said. PM Lee said both sides are each other's closest neighbour, whose "relationship is further strengthened by bonds of kinship, friendship and memories". "Singapore and Malaysia will always have a unique place for each other in our hearts," he said, adding that he looked forward to working with Dr Mahathir and his government to strengthen this bond. Dr Mahathir will receive an honorary doctorate from the National University of Singapore today. He will also attend the ASEAN Summit. 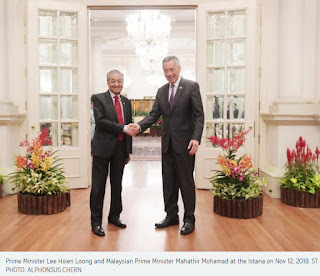 Prime Minister Lee Hsien Loong and his Malaysian counterpart Mahathir Mohamad yesterday, looking deep into the past, spoke of the strong ties between their two countries at a lunch to welcome the Malaysian leader on his first official visit to Singapore in his current stint as PM. In his speech at the Istana event, PM Lee noted that while the two-day official visit is Tun Dr Mahathir's first as Malaysia's seventh prime minister, Dr Mahathir is very familiar with Singapore. He has visited the Republic many times and also collaborated with it on projects with lasting benefits for both nations, PM Lee added, citing the Linggiu Dam in Johor and the Second Link in Tuas. Dr Mahathir, 93, led Malaysia for 22 years until 2003 and was re-elected in May this year. PM Lee, speaking at the lunch, said they had a good meeting and discussed ways to deepen cooperation. "Malaysia is Singapore's closest neighbour, and vice versa. We are bound by geography and history. Our economies are extensively intertwined," PM Lee said. Also, Singapore and Malaysia are each other's second-largest trading partners, and Singapore is Malaysia's second-largest foreign investor. "Our relationship is further strengthened by bonds of kinship, friendship and memories. We all have friends and relatives who live, study or work across the Causeway, and we feel at home when we visit each other," he added. Some of Singapore's Cabinet members were born and raised in Malaysia, PM Lee noted, while several Malaysian ministers were born here, or grew up or studied here. "And when we are overseas, we can pick each other out by how similarly we speak, dress and behave. The connection is instant," he said. PM Lee said that for Singaporeans and Malaysians, himself included, many of their best memories were made in each other's countries. "My first family trips with my parents were to Cameron Highlands," he recalled. "We would drive up to Kuala Lumpur, taking most of a day, and break journey overnight, staying at the Railway Station Hotel because I was interested in trains." He recounted how the following morning, the family would drive from KL to Cameron Highlands, stopping along the way at the town of Bidor in Perak for wonton noodles made with freshwater prawns caught in mining ponds. PM Lee noted that Dr Mahathir and his wife, Tun Dr Siti Hasmah Mohamad Ali, met in Singapore, studying at the King Edward VII College of Medicine, now part of the National University of Singapore. That was where they started their courtship, which led to a happy marriage of more than 60 years, he added. "When we met in May 2018, Dr Mahathir spoke fondly about his time in the college and his old classmates whom he kept in touch with for many years, but had not seen for a while," he added. "So I am happy that NUS will confer an Honorary Doctorate of Laws on Dr Mahathir tomorrow, and many of his old friends will be at the ceremony," he said yesterday. "Singapore and Malaysia will always have a unique place for each other in our hearts, and because of our proximity and interdependence, we will always have an interest in each other's development and success," he added. Dr Mahathir, in his speech, also underlined the close ties between both nations, saying they "are like twins in a way, except perhaps the elder twin is a little bit bigger than the younger twin and a bit older". Citing Singapore's recent help, he said: "I wish to record here our appreciation for the help extended by Singapore during the present currency crisis we had recently. "If there is any way we can return the hospitality, we will try to do so." He added that the most important thing is to continue the good relations. As would be the case between any two countries, there will be some differences and competition, he noted. "But the competition is always healthy - it helps us to make every effort to win, and this really helps us to grow even faster." Even so, Malaysia and Singapore are mutually dependent, he added. "Singapore has no hinterland and must use Malaysia as a hinterland. On the other hand, for a very long time, Malaysia had to depend on Singapore for its exports and imports because Singapore has developed into a great port that is comparable to the greatest in the world. "And we need the services of this port and other services related to trade and industry," he added. Dr Mahathir also said he very much appreciated that PM Lee was the second leader to visit him after his Pakatan Harapan coalition won the general election in May. The first was Brunei's Sultan Hassanal Bolkiah. "It was not a very formal visit - no parades, no inspecting of guard of honour but, nevertheless, the reception was sincere as can be," he added. "I hope this visit will cement the strong relations between our two countries and grow the relations, so each one of us can benefit from having two neighbours which are not at odds with each other - at times competing with each other - but most of the time working with each other." Dr Mahathir, who will attend this week's ASEAN Summit, also pointed out that together, Singapore and Malaysia can be very effective in helping the whole region to grow. Noting that not many regional groupings have survived in the world, he said: "ASEAN has not only survived but continues to work very closely together and to grow. "So there is much at stake in this relationship between Singapore and Malaysia, and I'm glad to make this visit and help in discussions with Mr Lee on our relations and how to improve the relations." Singapore's Ministry of Foreign Affairs (MFA) said in a statement that the two leaders had a wide-ranging discussion on bilateral and regional issues of mutual concern. It added that PM Lee emphasised Singapore's intention to continue constructive, forward-looking relations with Malaysia and reiterated Singapore's commitment to build on their strong cooperation and find new areas of collaboration for the benefit of their people. PM Lee also expressed his appreciation to Dr Mahathir for Malaysia's support for Singapore as ASEAN chairman, and both leaders agreed to work together to continue strengthening the regional grouping, the statement added. Malaysian media subsequently reported Dr Mahathir telling Malaysian reporters that the Singapore Government was more open to discussing several recurring issues, including the water deal. In response to media queries, a Singapore MFA spokesman said: "Both sides expressed their differing views on the right to review the price of water under the 1962 Water Agreement. They expressed their willingness for officials to have further discussions to better understand each other's positions." Malaysian Prime Minister Mahathir Mohamad called on President Halimah Yacob at the Istana yesterday, after he was hosted to a welcome ceremony by Prime Minister Lee Hsien Loong. 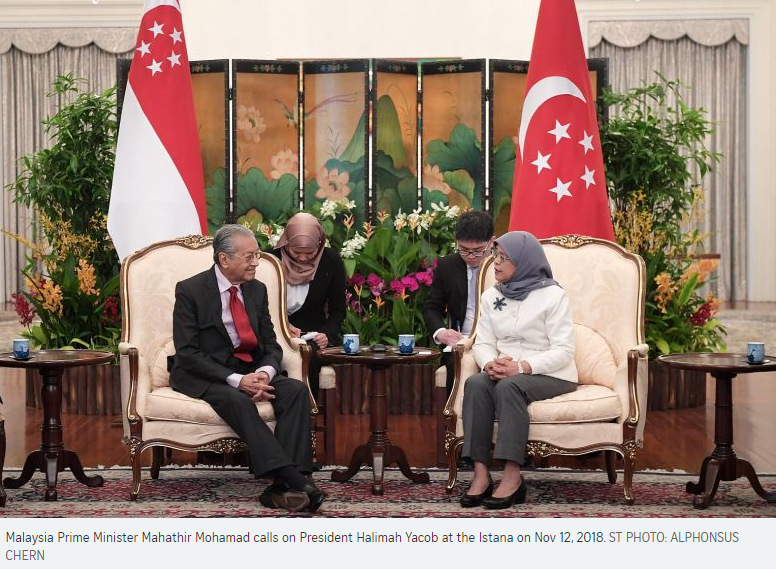 Singapore's Ministry of Foreign Affairs (MFA) said in a statement that Madam Halimah and Tun Dr Mahathir affirmed the deep historical and people-to-people ties which form the foundation of Singapore-Malaysia relations, and welcomed continued, mutually beneficial cooperation between their countries. 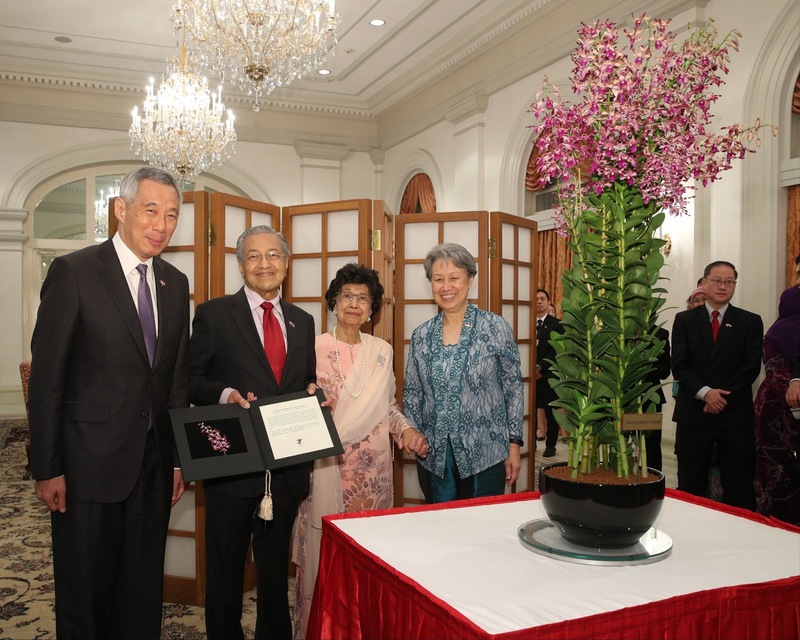 Dr Mahathir and his wife also attended an orchid naming ceremony on the Istana grounds. The orchid, named the Dendrobium Mahathir Siti Hasmah - after Dr Mahathir and his wife, Tun Dr Siti Hasmah Mohamad Ali - is a cross between Dendrobium Kiyoshu Blue and Dendrobium Pink Lips. In the evening, Dr Mahathir attended the ASEAN Business Awards gala dinner as a distinguished invited guest. The dinner, which President Halimah also attended as its guest of honour, recognised outstanding businesses in the region that have shown significant progress in establishing and reinforcing their foothold across various industries. Today, Dr Mahathir will be hosted to lunch by Emeritus Senior Minister Goh Chok Tong. Dr Mahathir's alma mater, the National University of Singapore, will confer on him an Honorary Doctorate of Laws, MFA said. The Malaysian Prime Minister will also attend the 33rd ASEAN Summit and related meetings from today until Thursday. A few hundred guests gathered at the NUS Yong Siew Toh Conservatory of Music yesterday to witness Malaysian Prime Minister Mahathir Mohamad receive an honorary doctorate in law from the National University of Singapore, but he still made time for a handful of old college friends from seven decades ago. "Can we have a hug?" was the first thing former cardiologist Wong Hee Ong, 91, said when she met Tun Dr Mahathir. Like him, she is a member of the "Medicine Class of 1947", the cohort of 76 students who enrolled at the King Edward VII College of Medicine that year. The college later became part of NUS, which yesterday conferred the doctorate on Dr Mahathir in recognition of his outstanding leadership of Malaysia and his enduring contributions to the longstanding bilateral relations between Singapore and Malaysia. Dr Mahathir, 93, is on his first official visit to Singapore since emerging from 15 years of retirement to become prime minister again in May. He had previously served from 1981 to 2003. "Malaysia's longest-serving prime minister and the world's most senior elected statesman returned to helm his country's government earlier this year in a stunning demonstration of his abiding love for Malaysia and his desire to enhance growth and prosperity for his countrymen. He is, in many eyes, a living example of bold leadership and steadfast resilience," Professor Chong Yap Seng, dean designate of the NUS Yong Loo Lin School of Medicine, said in his citation. Dr Wong attested to the formal compliments read out on stage. She said that during the 1997 Asian financial crisis, Dr Mahathir studied books on finance "day and night". "He is that way... He doesn't just say things without knowing. He will study it," she told The Straits Times. One of his bold moves then was to ignore the International Monetary Fund's (IMF) recommendations for Malaysia to raise interest rates and trim public spending, and instead raise government spending and impose currency controls. Critics and the IMF later acknowledged that Malaysia recovered from the crisis quicker than its South-east Asian neighbours due to these policies. 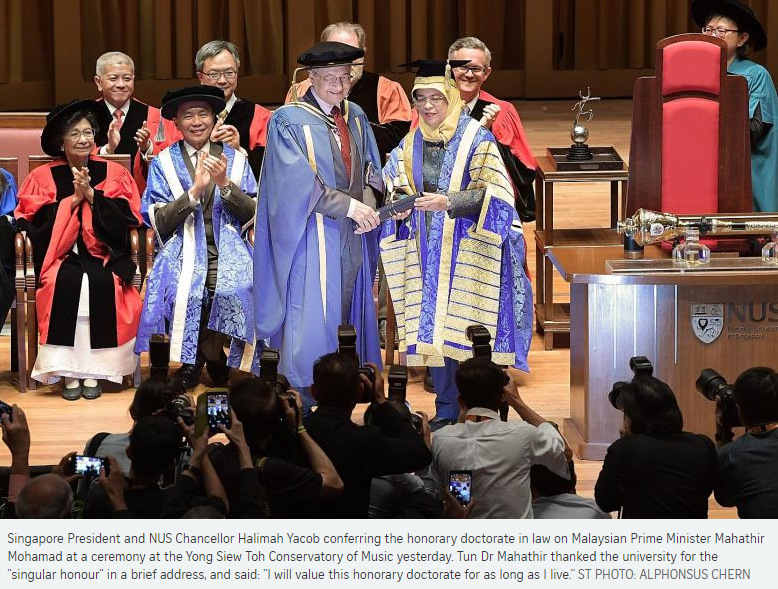 In a brief address after receiving his doctorate from Singapore President and NUS Chancellor Halimah Yacob, Dr Mahathir thanked the university for the "singular honour" and said: "I will value this honorary doctorate for as long as I live." It was while at medical college from 1947 to 1953 that Dr Mahathir met his wife, Tun Dr Siti Hasmah Mohamad Ali, 92, who was given a distinguished alumni service award by NUS yesterday for her service in public health and for being an inspiring role model for women doctors in Malaysia. "It all began, classmates say, when Tun Dr Mahathir became a frequent visitor to Holne Chase, the hostel for female students where Tun Dr Siti was staying," NUS president Tan Eng Chye said in his speech, to laughter from the 600-strong audience. Dr Mahathir's interest in politics was evident during his college days, when he regularly contributed articles on Malay issues for The Straits Times under the pen name Che Det, a nickname he now uses for his blog. He was a medical doctor in his home state of Kedah for several years after graduating, before being elected as an MP in 1964. Known for his blunt manner and barbed remarks during his first stint as premier, there were concerns that Dr Mahathir's return to office would test relations between Singapore and Malaysia. He tried to address those concerns yesterday. "Singapore and Malaysia remain good neighbours," he said. "Yes, we do have problems, there may be some competition between us, but... we have been able to resolve these problems in a very peaceful way," he said. Malaysian Prime Minister Mahathir Mohamad said he appreciates Singapore's role in helping his country reclaim monies laundered from troubled state fund 1Malaysia Development Berhad (1MDB). "Some people brought money belonging to 1MDB to Singapore, and many people were paid out of money that was stolen. Singapore took action to arrest them, to charge them and all that, and also to return to us the money that has been stolen. That is cooperation that we appreciate," he told The Straits Times in an interview yesterday. The Monetary Authority of Singapore shut down two private banks in 2016, fined eight banks nearly $30 million over 1MDB-related offences, and charged six persons. And in September, the State Courts ordered the return of $15 million in 1MDB-linked funds to Malaysia. 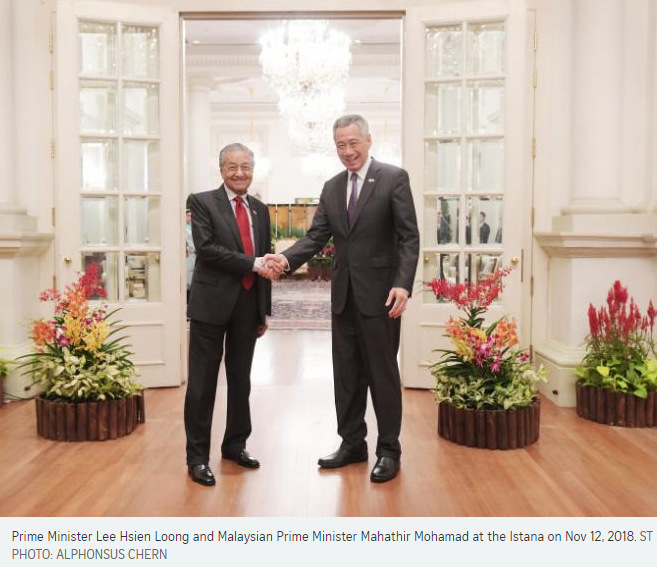 Tun Dr Mahathir alluded to this help after meeting Prime Minister Lee Hsien Loong on Monday, and said bilateral talks were largely about cooperation. They also discussed water pricing. Singapore's Ministry of Foreign Affairs said both sides expressed their differing views on the right to review the price of water under the 1962 Water Agreement and their willingness for officials to have further discussions to better understand each other's positions. Dr Mahathir echoed this yesterday, saying: "There is still a need for us to discuss the matter. We have differences about interpretations and I think we will continue to have discussions at official levels and at the political level, and we hope that we can reach some agreement." He also said there was a need for an additional bridge between the two countries, noting that traffic between Johor and Singapore was far heavier than between Penang and the mainland. "Yet Penang has got two bridges, and they are constructing a tunnel." "We need more bridges between the two countries. We hope we can have a direct bridge - one half being Singapore, one half being Malaysia. But if that is not possible, of course Malaysia will go ahead with its own plans," he said, revisiting a position he held during his first stint as PM from 1981 to 2003. Asked about these plans, he said Malaysia "had this so-called crooked bridge which does not encroach on Singapore land or Singapore territory at all". In 2003, he announced that Malaysia would go ahead and build a six-lane S-shaped highway that would curve to allow vessels to pass under it. Told by ST that such a bridge would merely replace the Causeway and not be an extra link, he said: "More bridges would be better. And it won't hurt anybody." He also said: "There are instances where we need to partner. There are occasions when we need to compete... Sometimes we succeed, sometimes Singapore succeeds. Competition means somebody loses, so the other party can gain." ASEAN needs to emphasise real cooperation and not just make a show of talking about it at meetings, Malaysian Prime Minister Mahathir Mohamad said yesterday, ahead of the opening of the ASEAN Summit. Speaking on the way forward for the grouping in an interview with The Straits Times at his hotel suite, the 93-year-old leader said one of the obstacles towards integration is suspicions from less developed countries that opening up could curb their own development. "One has to remember that countries which are less developed are rather suspicious, that they are very concerned about their own development and they think that opening up their markets may result in an influx of goods from other ASEAN countries. So, the tendency is to limit imports of certain products," he said. "We must stress greater cooperation, and the cooperation must be real. It is not good just to talk about cooperation but when you go back, you become very protective and you put in obstacles to ASEAN cooperation." While Tun Dr Mahathir has lamented the untapped potential of ASEAN as an economic bloc before, he appeared to temper some of his previous criticisms of the grouping. During the half-hour interview that spanned topics ranging from global affairs to bilateral relations to Malaysian politics, Dr Mahathir picked his words carefully and was largely cautious not to name names. Only when the conversation moved to domestic issues did he seem to let his guard down. He made the point of stressing his continued belief in ASEAN. "I have to be (a believer)," he said. "If you give up on ASEAN, then I think we will be going back to the days before ASEAN when we were not working together and not understanding each other's problem." This resulted in countries taking confrontational positions, he said. He added that a point he intends to make at this week's meetings is that ASEAN's size can be a valuable asset. "ASEAN is a very big market. It has almost 700 million people, and even if the per capita is low, poor people too have their needs. And if you can work out what are their needs and try to supply them from within ASEAN, I think it will contribute to the growth of ASEAN." Paying tribute to the grouping's resilience, Dr Mahathir said: "ASEAN has survived. Not many regional organisations have survived. Even the European Union has not really survived. Of course, with (organisations in the) Caribbean, South Asia, South America, they have not survived. But ASEAN has survived and has continued to work together, and this is an achievement." Since returning to power this year, 15 years after retiring as prime minister, he has cancelled or put on hold mega deals with China signed by his predecessor, Najib Razak. Many are watching how he will carry himself at a summit taking place amid a backdrop of growing economic competition between the United States and China. But Dr Mahathir yesterday brushed off concerns about how trade tensions between global powers might once again pit factions in the grouping against one another. He said: "ASEAN was not founded as an economic community; it was founded in order to enable leaders of the ASEAN countries to settle their problems round the table. "In that, it has fully succeeded... But the world situation may affect some of the members because they are trading nations. But generally, a crisis in the world does not affect ASEAN that much." He, however, said he intends to urge US Vice-President Mike Pence - who will be in town for the summit in place of President Donald Trump - to stop the trade war. "It hurts both the initiator as well as the other party. And it also hurts the economy of the world. If we can, we will like them to stop this trade war. But it is not a one-handed thing, both sides have to agree. "And the US is coming here... if we have an opportunity, we will have to tell them, look, a trade war is not helping either US or China or the rest of the world." Trade and economic matters aside, attention will be on Dr Mahathir's interactions with Myanmar leader Aung San Suu Kyi at the summit. As countries are arranged in alphabetical order, the Malaysian leader will find himself seated next to Ms Suu Kyi - someone he has criticised publicly because of the Rohingya crisis. At the United Nations General Assembly in September, Dr Mahathir condemned the massacre in the Rakhine state. Asked what he would say to his neighbour, he replied: "Well, I had written a letter to her with regard to the Rohingya. I had written letters to her when she was under detention and I was very sympathetic towards her cause and her determination to win and, finally, of course, she achieved her objective. "But in the case of Rohingya, there is somehow a different attitude. I mean people who have been under detention should understand the sufferings of people who are oppressed."